Renault SA, which this week outlined plans to boost its Russian supplier network and produce engines with local partner AvtoVAZ, has grabbed a lead in the fast-growing market that Volkswagen and Ford may struggle to follow. CEO Carlos Ghosn stands to gain more from his three-year pursuit of cooperation with AvtoVAZ after Russia this year introduced regulations penalizing carmakers relying on imported parts. "The investment seemed risky in 2008 and worse in 2009, but now it looks as if Russia could turn out to be Renault's China," Deutsche Bank analyst Gaetan Toulemonde said. China's ascent to become the world's biggest auto market has boosted Volkswagen AG, the country's leading overseas carmaker. Renault, which paid $1 billion for its 25 percent stake in Russia's largest carmaker, wants to use AvtoVAZ's Soviet-era Lada brand to slash costs by sharing production and suppliers. Japanese affiliate Nissan Motor Co. will introduce a Russian- built car based on the no-frills Renault Logan range in 2012, and AvtoVAZ may begin making engines and gearboxes for all three brands the following year, the French carmaker said July 19. Under rules implemented this year, carmakers assembling vehicles in Russia to avoid import duties must now also pledge to source engines, gearboxes and 70 percent of components locally to avoid tariffs of up to 30 percent on overseas parts shipments. A previous decree included lower targets for Russian- made content and no specific requirement for powertrains. "In the past, Russia's domestic carmakers made pretty much everything for themselves, so there was no real supply chain for the foreigners," London-based Barclays Capital analyst Michael Tyndall said. "Unlike Renault, many of them waited to see what would happen." Rising incomes are increasing potential spoils for foreign carmakers, with 10 million Russian households already above the $50,000 threshold. The country's auto market is set to expand 21 percent to 2.3 million vehicles in 2011, said Emmanuel Quidet, a Moscow-based partner with Ernst & Young. The consulting firm forecasts Russia will overtake Germany as Europe's biggest auto market in 2015 with 3.4 million deliveries. Renault began work to increase Russian purchasing soon after its 2008 AvtoVAZ stake purchase, while rivals including Volkswagen and Ford Motor Co. are only now moving to widen assembly with local partners. Wolfsburg, Germany-based VW agreed last month to build cars with OAO GAZ, ultimately targeting joint production of 110,000 units, after expanding its own facility south of Moscow to produce 150,000 vehicles annually. Ford, which currently makes models including the Focus compact in Russia, signed a similar accord with OAO Sollers in June, with an eventual capacity of 350,000 vehicles. Renault and Nissan have a combined 11 percent share of the Russian market, compared with 7 percent for Volkswagen's brands. Renault has 130 outlets in 86 Russian cities, including all those with 300,000 inhabitants or more. Russian-made parts account for 56 percent of components used to assemble Renault models including the Logan and Sandero hatchback on existing Moscow production lines, the carmaker said this week, pledging to lift local content to 74 percent by 2013 and add to its pool of 40 accredited Russian suppliers. 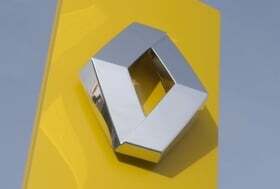 "Renault's main rivals are closer to 30 percent, so it clearly has the advantage there," Deutsche Bank's Toulemonde said. The Renault-Nissan alliance is in talks with AvtoVAZ shareholders Troika Dialog and state-owned Russian Technologies Corp. to purchase another 25 percent holding, for a total controlling stake of 50 percent plus one share. Nissan will produce its first sedan using the Logan's technical platform on a shared production line being built at AvtoVAZ's factory in Togliatti, Bruno Ancelin, Renault's Russia and Eurasia chief, said in interview this week. AvtoVAZ and its partners also plan to invest in a powertrain plant at the site to produce gearboxes and 1.6-liter gasoline engines for Renault, Lada and Nissan models, Ancelin said. The plant will produce as many as 400,000 engines annually, he said. That's twice the capacity of a powertrain facility planned by Ford and Sollers. The plan illustrates the competitive edge AvtoVAZ offers because rivals with smaller market shares would struggle to justify the investment, said London-based Credit Suisse analyst Erich Hauser, adding that Renault shares haven't priced in the potential Russian gains. The stock has dropped 16 percent this year, compared with Volkswagen's 21 percent increase and a 1.5 percent advance in the Bloomberg Europe 500 Autos Index. "Ford and VW are increasing their production too, but nothing these guys do will match the scale of AvtoVAZ," Hauser said. "Russia stands out as one area where Carlos Ghosn has demonstrated real foresight." Still, Ghosn faces a challenge to deliver the savings promised by AvtoVAZ's size while rolling out new Lada models to stem the brand's declining market share. The first two Ladas based on Renault's Logan are to be introduced next year. Yaroslav Batashev, a 29-year-old manager in a Moscow consumer goods company who owned a Lada 2114 for three years as his first car, said Renault should avoid changing the brand too drastically. "Its strongest side is the low purchase price and servicing costs," Batashev said. "It's important that the Renault partnership doesn't alter that."